Survation’s second poll in their General Election 2017 series for ITV’s flagship breakfast programme Good Morning Britain gives the Conservatives an 18-point lead over Labour. 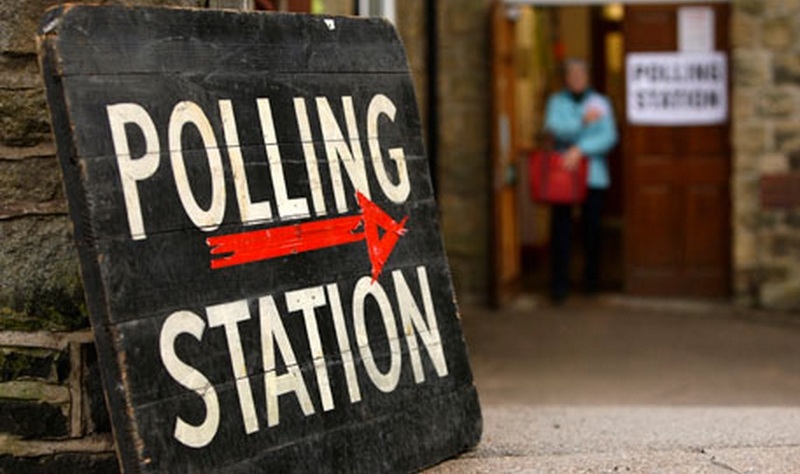 Methodology: Survation interviewed 1,016 UK residents aged 18+ using a combination of demographically pre-balanced mobile and landline data, conducting fieldwork from the 12th to the 13th of May. In a week where Labour’s leaked draft manifesto dominated headlines, we tested the popularity of some of its content. All policies tested garnered majority support, with a requirement of councils to build an additional 100,00 new council houses every year (62% support) the most popular, while bringing railways back into public ownership as existing rail franchises expire (53% support) was the least. 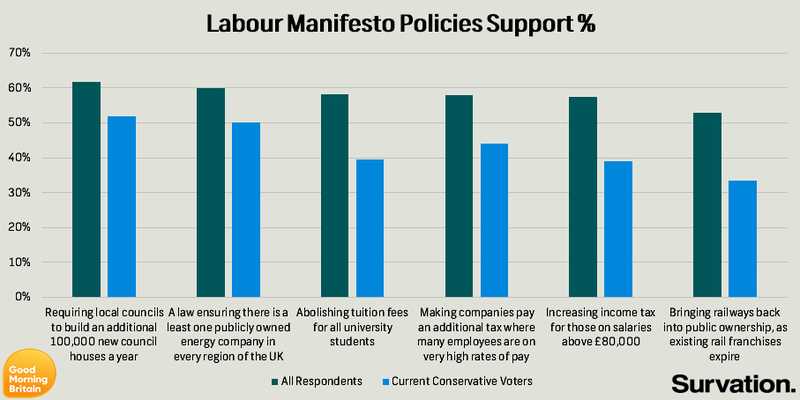 Interestingly, three of the policies tested had more support than opposition from current Conservative voters; the aforementioned council house policy, ensuring there is one publicly owned energy company in every UK region, and making companies pay an additional tax where many employees are on very high rates of pay. More than 7 in 10 people say ‘policies of the party’ is the most important factor when deciding how to vote, compared to other factors such as ‘party leader’ (13%) and ‘the party itself’ (10%). Nearly a quarter (23%) of current Conservative voters say that the party leader is the most important factor when deciding how to vote, compared to only one in twenty Labour voters. 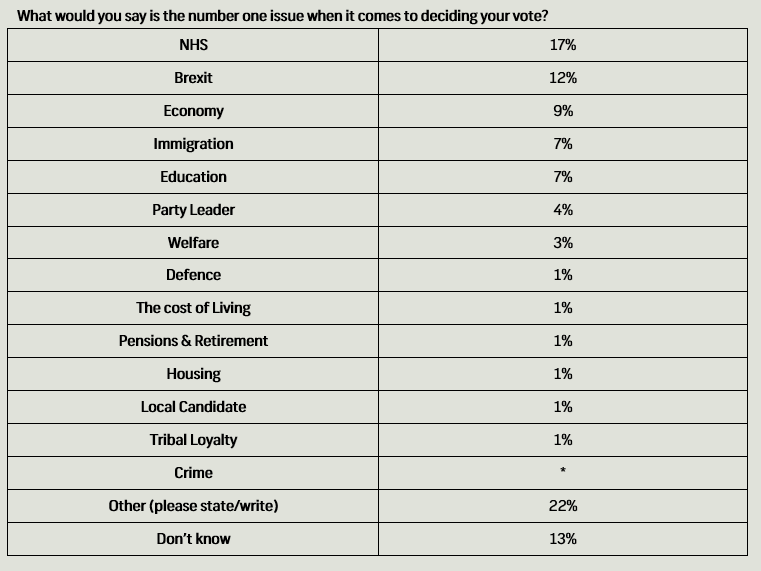 The NHS (17%), Brexit (12%) and the economy (9%) were the most important factors to people when deciding how they may vote. Only a quarter (24%) of all respondents think that Jeremy Corbyn would make the best Prime Minister compared to more than half (58%) who think that Theresa May would make the best Prime Minister.